The samples were taken from a high impedance audio input port direct to Logic Pro. The samples were recorded raw (no EQ, no effects). All samples are normalized. Currently, I sampled only the E string. I like the heavy E string with rich harmonics. For fun, I also added the FFT graph of a Bösendorfer from the stock Logic Pro sample collection. Note: This is the initial test and is continually being updated. 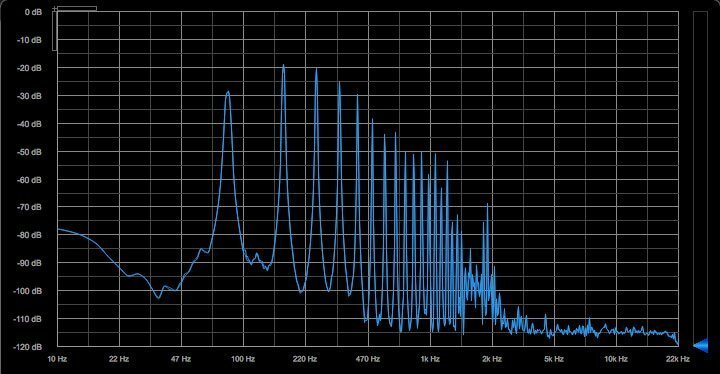 See Let it breathe (part 2): More Frequency Analysis and Let it breathe (part 3): Frequency Response for latter installments. The test pickup in this experiment has 2000 turns AWG 42 magnet wire with about 260 ohms D.C. resistance. The differential Op Amp has a gain of 5 and generates a peak-to-peak voltage of around 2 volts (moderate pick attack). For this early prototype, I am using the plain TL072 Op Amp. Already, I am quite pleased with the very low noise even without any shielding at all (image at right). 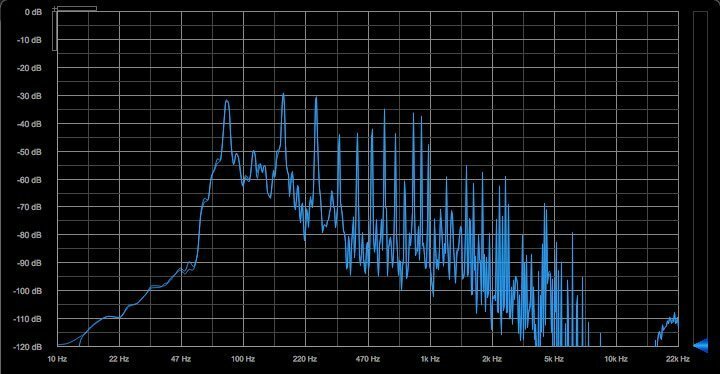 Next time, I’ll have some more graphs comparing the noise floor of the hex pickup compared to the passive humbucker and the very noisy single coil pickup. I also intend to experiment with better Op Amps and even lower impedance coils. This initial analysis will serve as a good benchmark for comparison. 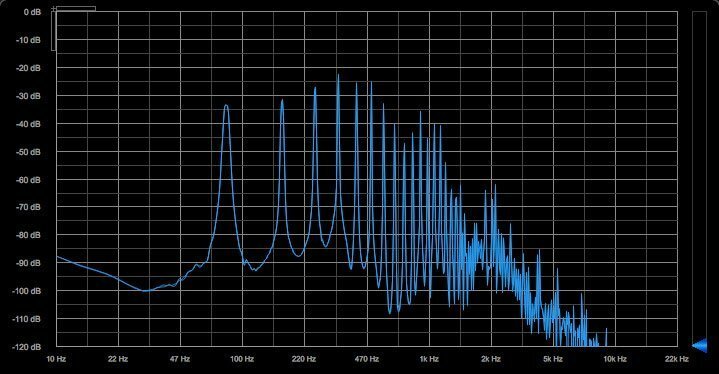 The 60 Hz hum and its harmonics is quite evident in the Stratocaster spectrum. 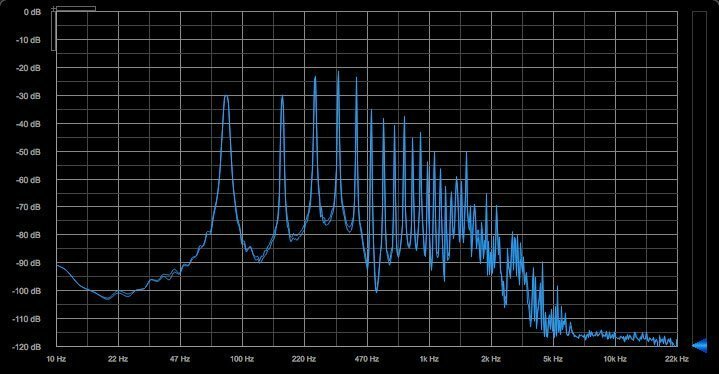 Interestingly, the same 60 Hz (and 120 Hz) shows up as a smaller bump in the Les Paul graph. The so-called humbuckers do not fully cancel hum due to the irregularities in the construction of both coils. It is impossible to manufacture perfectly matched coils. 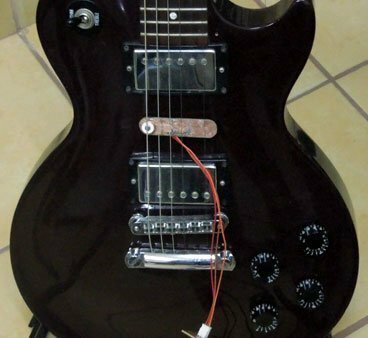 Any irregularity in construction will degrade the common mode rejection of the humbucker. Differential amplifiers have better common mode rejection and are easily balanced by using matched resistors with 1% or even 0.1% tolerance. As can be seen in the graphs, the lower impedance test pickup is very rich in harmonics. It has a lot more harmonic content than even the bright, but very noisy Stratocaster pickup. The difference in harmonic content between a 24¾” scale Les Paul and a 25½ scale Stratocaster is also quite pronounced, even when using the same test pickup on both. 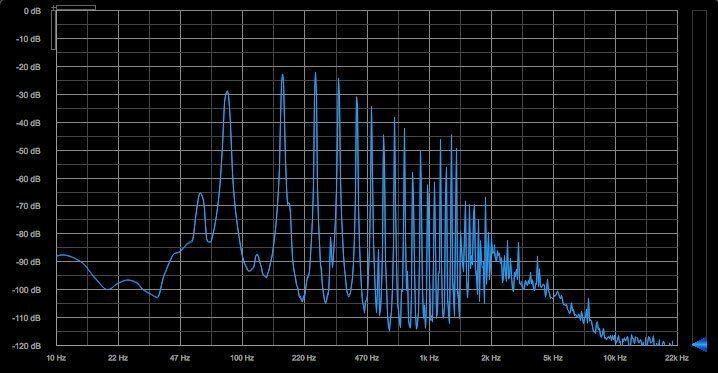 Most of the higher frequencies in the FFT graph of the Stratocaster is just the noise from electromagnetic interference.